Almost 80 years(!) after Disney first enchanted audiences with the animated tale of a little elephant who could fly, the studio is back with a new live-action reimagining of DUMBO. 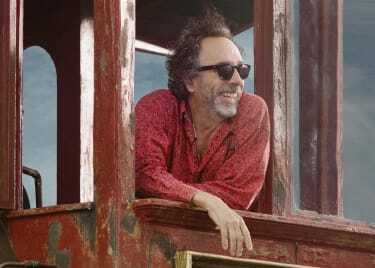 Directed by Tim Burton, the March 29 release features an incredible cast of performers, including a few actors who have worked with Burton before. 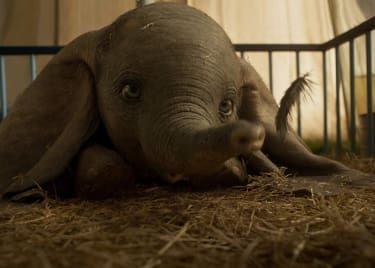 Before we fall in love with that adorable elephant all over again, let’s take a closer look at the wonderful cast of Disney’s DUMBO. Colin Farrell headlines the cast as Holt Farrier, a war veteran and father of two. He’s missing an arm, which makes finding work difficult. Holt is approached by a circus owner named Max Medici (more on him in a minute), who asks the veteran to care for a baby elephant with curiously big ears. DUMBO isn’t Farrell’s first Disney adventure: He previously starred in SAVING MR. BANKS. More recently, the actor appeared in FANTASTIC BEASTS AND WHERE TO FIND THEM and last year’s WIDOWS. 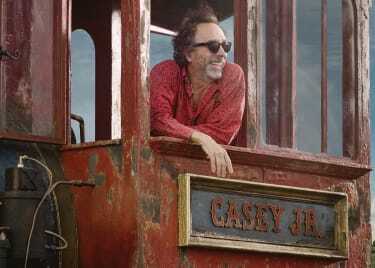 The veteran actor plays circus owner Max Medici in DUMBO. Max also serves as ringmaster for the circus, which has fallen on hard times … until Dumbo is born, and Max realizes those giant ears give the little elephant a remarkable gift. DeVito also starred in two other Tim Burton movies: BATMAN RETURNS and BIG FISH. Eva Green stars as Colette Marchant, a French trapeze artist who performs in Max’s circus. 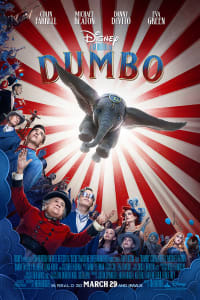 DUMBO is the third Tim Burton film Green has appeared in: She previously starred in DARK SHADOWS and played Miss Peregrine in MISS PEREGRINE’S HOME FOR PECULIAR CHILDREN. Every Disney movie needs a bad guy, and in DUMBO, that guy is Michael Keaton. The actor played Batman for Tim Burton in 1989’s BATMAN and again in 1992’s BATMAN RETURNS. Now, he co-stars here as V.A. Vandevere, a ruthless and eccentric businessman who buys Max’s circus so he can turn Dumbo into the main attraction. This pair of charming newcomers play the children of Colin Farrell’s character. Nico Parker and Finley Hobbins are Milly and Joe Farrier (respectively), and they see something special in Dumbo before anyone else does. You may not recognize his face, but you’ll surely recognize the voice of Michael Buffer, the longtime boxing and professional wrestling announcer. In DUMBO, he plays Dreamland ringmaster Baritone Bates. And finally, there’s character actress Sandy Martin, best known for roles on “Big Love” and “It’s Always Sunny in Philadelphia.” She’s playing Verna, the secretary. DUMBO turns AMC into a circus on March 29.